What ails your network? Most people’s networks are under-developed. People assume that by joining a group that automatically gives them relationships with the other members. Not so! And many people make the mistake of asking for too much too soon . . . or too little too late. Here’s a fresh look at the various kinds of relationships that are possible with the people you meet. Even more important, if you know what kind of relationship you have with someone, the next step you can take to develop the relationship becomes obvious. Imagine your network as a bulls-eye. Accidents float around outside the concentric circles. You’re in seat 14A. Next to you, in 14B, is an Accident. An Accident is a person you’ll never see again, unless you make it happen by exchanging contact information and getting back in touch. In one study, 27 percent of people developed a relationship with someone they met on an airplane. But it’s not smart to rely on meeting people by chance. Inside the outermost circle, put the word Acquaintance. An Acquaintance is a person you could find again, if you had to because you know someone in common. Think of the architect you met at your cousin’s daughter’s wedding. But you’re not going to run into her in the normal course of your life, but you could find her again. Remember your Acquaintances when you want more diversity in your network. Cultivating an Acquaintance will bring you in touch with people you don’t normally see. Inside the next circle, put the word Associate. An Associate is a person who belongs to a group you belong to. That means, you’ll see her repeatedly. We believe it takes six to eight “meetings” before two people know and trust each other enough to go to bat for each other. So Associates, whom you’ll see again and again, are your easiest contacts to develop. However (and this is one of the biggest mistakes networkers make), if you don’t develop these relationships, you will remain only co-members of a group. You won’t have begun to act as resources for each other. Once you have acted – exchanged something of value – a tip, a resource, some information – you and your Associates become Actives. Actives are people you are actively trading with. When you give first, you plug into a quirk of human nature that’s the basis for strong networking relationships: The Reciprocity Principle. It goes like this. If you give somebody something, she will try to give you something back. Two-way swaps are the meat and potatoes of networking. But there are ways to make relationships even more relevant. When that happens, you and your contact will be able to help each other even more. Advocates (inside the next circle) know you so well and trust you so completely that, when they see an opportunity that’s perfect for you, they’ll grab it and give it to you. Because you’ve taught them so much about yourself, they’ll unhesitatingly pass your name along to others. Advocates can give vivid examples of you in action, serving a client, saving the day, solving a problem. Finally (in the center circle), you’ll have a few Allies. Allies are on your personal board of directors of your life . They know where you’re headed and will do all they can to help you reach your goals. They will actually seek out opportunities for you. (You’ll do the same for them.) They’ll celebrate with you when things go well, commiserate with you – and even tell you the truth – when things go wrong. Take a minute to think about your networking contacts. Draw out the bulls-eye and decide, which A best describes each contact. Then you’ll be able to determine what your next step could be with each person. As you weight the risk and value of any next step, you’ll be networking strategically. And you’ll avoid lots of the turn-offs and mistakes that people typically make when networking. If you want to move from Active to Advocate with a contact, for example, tell stories so that your contact will be able to describe your capabilities to others. Ask for stories from your contact, so you can reciprocate. 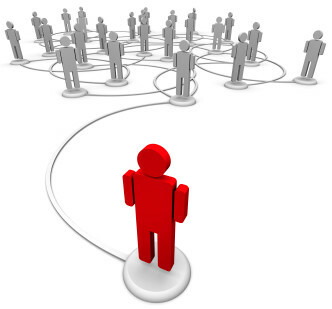 Using this As model will help you create a fully developed network and help you make networking an art, not an accident.